The Kindle DX might be a good e-book, but the consensus among students at Princeton is that it is a very poor replacement for real books. Very poor, sir. It’s not secret that students make a holy mess of their books, annotating, dog-earing, doodling in the margins — and none of that is easy (if it’s even possible) on the Kindle, or any other e-book at the moment. Sure, if all you need to do is read plain-text book, it’s handy. But what about diagrams? Full-color illustrations? Scratch-and-sniff patches? When I think of the shortcomings of the Kindle DX, my mind suddenly shifts to the Courier. My god, what a difference! If Microsoft can make the Courier anything like their demo video, that will actually be a replacement for many tools currently required by a student. Annotations? Check. Full color? Check. Schedule? Check. Facebook and Twitter? Check and check. 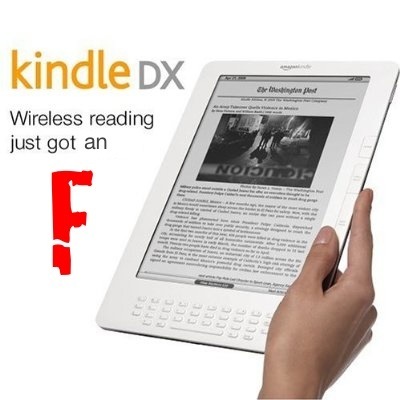 I’m sure there will be a market for the Kindle-like e-book for a good time to come, but until they offer the kind of functionality we’re going to be seeing in tablets come 2010, they’re always going to be limited to the latest Dan Brownloads.